So I am feeling better but not motivated enough to put my puffy congested face on video again just yet so you will have to get by with a previously unreleased episode of Santa Speaks Out. 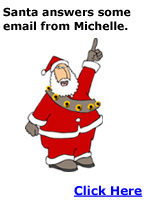 Wherein Santa clears up some misconceptions about his beloved holiday. Santa is a jolly of elf with a stomach that shakes like a bowl full of jelly. Stop complaining about your obesity. I did this series because I came across a santa suit. This is my favorite of the series but it's important to know that in preceeding shorts santa talked about how he is becoming incorporated.